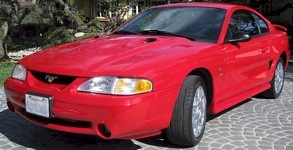 The 1997 SVT Cobra saw only a couple of changes over the 1996 model. The grille opening was enlarged and a new color, Pacific Green, was offered. Optional equipment continued to be limited to just the Preferred Equipment Package (Mach 460 sound system and leather seats) and the rear decklid spoiler.